New town centers or urban redevelopment projects are often derided as "sterile" or "soulless." In response, developers and local governments provide public art. While many such works have little relevance to the communities they're located in, some can honor and even create a local culture or identity. This sculpture in White Flint, called Alluvium, doesn't say much about the place it's located in. Montgomery County's planning department often requires developers to place public art in new projects, especially in urban areas like downtown Silver Spring and downtown Bethesda. At North Bethesda Market, a new complex of apartments and shops in White Flint, developer JBG Companies hired artist Jim Sanborn to create a sculpture he called Alluvium. 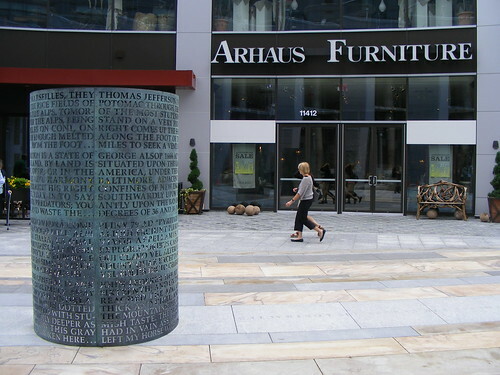 Located in the middle of a plaza, the bronze cylinder is embossed with quotes from John Muir and Thomas Jefferson and set in a waterfall meant to represent the Chesapeake Bay. Though the sculpture is named for the white quartz that White Flint gets its name from, it doesn't feel like a product of its place. Alluvium's narrative about the power of nature says nothing about the history or culture of White Flint as a community, nor does it provide an opportunity to create a new history or culture in White Flint. Not only does it resemble the artist's other works, but Sanborn admitted that the piece was largely inspired by the geography of Montana. If anything, Alluvium is an expression of JBG's ability to lavish money on the public spaces in its developments, which is important if they want to draw tenants to apartments renting for nearly $5,000 a month. 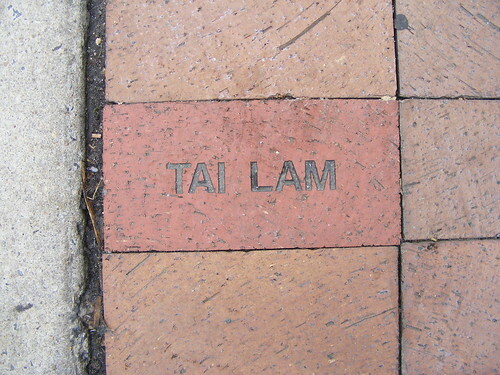 A brick with slain teenager Tai Lam's name was placed on Ellsworth Drive in downtown Silver Spring. Other urban centers in Montgomery County use public art to commemorate tragic events. In downtown Silver Spring, friends and family of fourteen-year-old resident Tai Lam created a memorial to him after he was murdered on a Ride-On bus. The impromptu assemblage of photos, notes and flowers sat at the base of a streetlight on Ellsworth Drive for several months before the Peterson Companies, which manages the public street on behalf of the county, laid a brick with Tai Lam's name on the sidewalk, smaller, more permanent tribute to the teenager. Meanwhile, in Bethesda, yoga-wear store Lululemon Athletica turned their storefront into a tribute to employee Jayna Murray, who was murdered by a coworker three months ago. 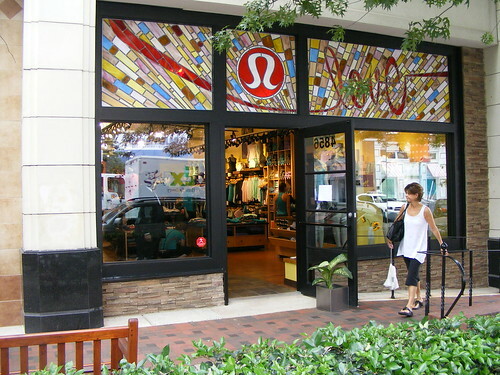 In place of the store's name, the façade bears a stained-glass window with Lululemon's logo and the word "LOVE." The stained glass window at Lululemon's Bethesda store honoring former employee Jayna Murray. Neither Tai Lam's brick or Jayna Murray's window were commissioned by the Planning Department. Both of them were relatively cheap to make and didn't involve renowned artists. You could argue that neither of them were public art, as Tai Lam's brick is part of an existing sidewalk and Jayna Murray's window was paid for by a store to be used in that store. Yet both pieces can be seen and interacted with by everyone who passes through the streets they're located on, making it a public intervention. And as tributes to members of the Silver Spring and Bethesda communities, both pieces are already more significant to that community than a commissioned artwork. Meaningful public art doesn't have to come out of tragedy. Those who commission, pay for and create an artwork should look at the place where the piece will be located and find some reference to draw inspiration from within that community, whether it's a significant event, person, or cultural oddity. Grand statements are nice, but they don't make a unique place. 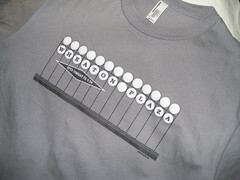 Public art that can celebrate the little things is the way to create local character. 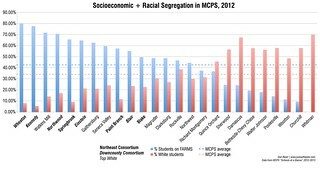 At one point they were funding two projects annually in public schools. The projects involved students in mural design and creation. Some are quite beautiful.